The Federal Aviation Administration (FAA) today “accepted the investigation report” regarding the results of SpaceX’s investigation into the cause of the company’s catastrophic Sept. 1, 2016 launch pad explosion of a Falcon 9 rocket in Florida, and simultaneously “granted a license” for the ‘Return to Flight’ blastoff of the private rocket from California as soon as next week – the FAA confirmed today to Universe Today, Friday, Jan. 6. “The FAA accepted the investigation report on the AMOS-6 mishap and has closed the investigation,” FAA spokesman Hank Price confirmed to Universe Today. All SpaceX launches were immediately grounded when their Falcon 9 booster and its $200 million AMOS-6 Israeli communications satellite payload were suddenly destroyed without warning during a routine preflight fueling test on Sept. 1, 2016, at pad 40 on Cape Canaveral Air Force Station in Florida. With today’s definitive action from the FAA the path is now clear for Hawthorne, Ca based SpaceX to resume launches of the Falcon 9 rocket as soon as Monday, Jan. 9. It will carry a fleet of ten Iridium NEXT mobile voice and data relay satellites to orbit from Vandenberg Air Force Base, Ca, for Iridium Communications. “SpaceX applied for a license to launch the Iridium NEXT satellites from Vandenberg Air Force Base. The FAA has granted a license for that purpose,” Price added. The SpaceX investigation report has not been released at this time. Liftoff of the SpaceX Falcon 9 with the payload of 10 identical next generation IridiumNEXT communications satellites is slated for 10:22 am PST (1:22 pm EST), Jan. 9, 2017 from Space Launch Complex 4E on Vandenberg Air Force Base in California. Furthermore all technical systems would appear to be ‘GO’ for the commercial rocket and commercial payload, following the official announcement by SpaceX CEO Elon Musk that the Falcon 9 rocket successfully passed its normally routine prelaunch static fire test of the first stage engines, on Thursday, Jan. 5. “Hold-down firing of @SpaceX Falcon 9 at Vandenberg Air Force completed,” SpaceX CEO Elon Musk tweeted Jan. 5. “Payload/rocket mating underway,” Iridium CEO Matt Desch elaborated and confirmed via twitter today. The static fire test involves briefly firing the first stage Merlin 1D engines for several seconds while the rocket remains anchored to the launch pad. The test is run to confirm that all the engines and rocket systems are technically ready for launch. In contrast to AMOS-6, the Iridium NEXT payload was not installed atop the rocket this time during Thursday’s test to keep them safely and prudently stored out of harms way – just in case another unexpected mishap were to occur. Members of the Iridium Communications team were on hand to observe Thursday’s static fire test first hand. “With great anticipation, team members observed the static fire test of the Falcon 9 rocket that will deliver the first ten Iridium NEXT satellites to orbit. Iridium is excited to share that the test is complete, and that SpaceX is reporting that the rocket should be ready for the first launch of the Iridium NEXT satellite constellation next week,” said Iridium officials. And since the launch window is instantaneous, there is no margin for error or delay from either a technical or weather standpoint. Currently, next weeks weather outlook is not promising with a forecast of rain and clouds on Monday morning and beyond. But only time will tell. “With completion of the static fire test, our first launch has just gotten that much closer,” said Matt Desch, chief executive officer at Iridium, in a statement. “Looks like we’re good to go for Monday!” Desch tweeted today. Also known as Iridium 1, this is the first of seven planned Falcon 9 launches to establish the Iridium NEXT constellation – eventually consisting of 81 advanced satellites. Indeed the FAA license approved today covers all seven launches. “Space Explorations Technologies is authorized to conduct seven launches of Falcon 9 version 1.2 vehicles from Space Launch Complex 4E at Vandenberg Air Force Base with each flight transporting ten Iridium NEXT payloads to low Earth orbit. The license also allows SpaceX to land the first stage on a droneship at sea in the Pacific Ocean. On Jan. 2, SpaceX issued a statement ascribing the Sept. 1 anomaly as being traced to a failure wherein one of three high pressure gaseous helium storage tanks located inside the second stage liquid oxygen (LOX) tank of the Falcon 9 rocket suddenly burst. Helium is used to pressurize the propellant tanks. They provided some but not many technical details. The failure apparently originated at a point where the helium tank “buckles” and accumulates oxygen – “leading to ignition” of the highly flammable liquid oxygen propellant in the second stage when it came into contact with carbon fibers covering the helium tank. The helium tanks – also known as composite overwrapped pressure vessels (COPVs) – are used in both stages of the Falcon 9 to store cold helium which is used to maintain tank pressure. Apparently the super chilled LOX or SOX can pool in the buckles and react with carbon fibers in the overwrap – which act as an ignition source. “Friction ignition” between the carbon fibers and super chilled oxygen led to the calamitous explosion. 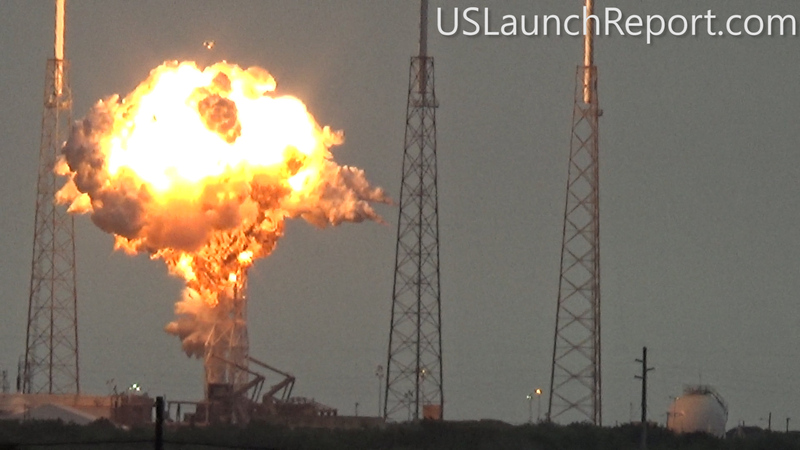 The Sept. 1 calamity was the second Falcon 9 failure within 15 months time and both occurred inside the second stage. If the Iridium liftoff is successful, SpaceX hopes to resume launches on the Florida Space Coast soon thereafter involving both commercial and NASA payloads using pad 39A at the Kennedy Space Center. SpaceX could launch an EchoStar communications satellite later in January and a cargo resupply mission for NASA to the ISS in February from KSC. Watch this space for continuing updates as SpaceX rolls the rocket out from the processing hangar and we watch the foggy weather forecast with great anticipation ! Stay tuned here for Ken’s continuing Earth and Planetary science and human spaceflight news. How about a summary of the failure report? It seems odd to get a story about the return to flight after the FAA accepts a report, and nothing about the report itself, only what’s next now that they have clearance. The “explosion” was fueled by the carbon fiber covering of the helium tank burning very rapidly using the liquid oxygen as oxidant. (The same reaction that occurs in a coal fired electric power plant.) Unfortunately this occurred inside the LOX tank, so the “Pipe Bomb Effect” was present, and this effect caused a proper explosion. KNEALY , I agree with you, that this report could be improved by including a web link to the complete FAA Report. I don’t think it should be proprietary to let people know if there have been engineering recommendations to seal off the carbon fiber overwrap altogether, in the future. These boosters are supposed to flown repeatedly, and if there is any cumulative buckling going on, the actual danger might be mitigated with a PTFE sheath over the entire wrapping, as myself and others have suggested over the past week. Teflon remains pliable at extremely low T, a one-mil sheath should be very light and subtract little from the final payload, and full millimeter, shrink wrapped to adhere and conform to any surface irregularities should withstand many cycles, and even allow even colder LOX and colder He to offset the added 500 or so grams. The tank is in the second stage so reuse isn’t currently an issue.